John B. Morris, the third bishop of Little Rock, was also of Irish lineage but he was born in Tennessee. After graduating from St. Mary’s College in Kentucky, he studied for the priesthood in Rome, where he was ordained June 11, 1892, at age 26. Within six years, Father Morris would be vicar general of the Diocese of Nashville. In another six years, on June 11, 1906, he was ordained bishop at the Nashville cathedral and was assigned to Little Rock as coadjutor bishop. 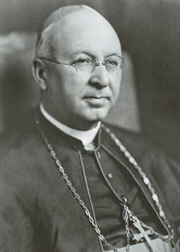 Bishop Morris took office immediately upon the death of Bishop Fitzgerald on Feb. 21, 1907. The Most Reverend Morris happily abided with a papal directive to U.S. missionary bishops that they establish seminaries for the education and training of priests. Bishop Morris believed a local clergy was vital to growth of the diocese. Indeed, he considered the founding in 1911 of what later became St. John Home Missions Seminary as the crowning work of his nearly 40-year episcopacy. Achievements were many and varied for this progressive bishop, who broadened the ministry of the Catholic Church in Arkansas. A particular emphasis was caring for the displaced. 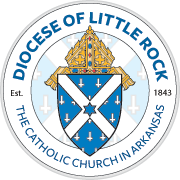 Bishop Morris chose a rustic setting near North Little Rock for the construction of St. Joseph Orphanage, which opened under the care of the Benedictine Sisters in 1910. He organized parishes for black Catholics in El Dorado, Fort Smith, Helena, Lake Village, Little Rock, North Little Rock and Pine Bluff; invited the Poor Brothers of St. Francis to manage a school for boys of modest means in a remodeled hotel west of Searcy, and brought in the Sisters of Good Shepherd to look after troubled girls and women in Hot Springs. Bishop Morris established Little Rock College in 1908 in the Pulaski Heights area of Little Rock. The seminary was open in 1911 at 25th and Gaines streets. The seminary eventually relocated to Pulaski Heights and the vacated building in downtown Little Rock was then used for the establishment of Catholic High School for Boys. Bishop Morris started a diocesan newspaper in 1911: The Southern Guardian, later The Guardian, was the forerunner of today’s Arkansas Catholic. Catholic High School opened in 1930 on 25th Street, in a building that once housed the seminary. Elsewhere, even in remote sections of the state, Bishop Morris saw to the building of parochial schools, hospitals, churches and mission stations. St. John seminary, meantime, produced new priests to serve a growing Catholic population. St. John’s success allowed Bishop Morris to set in motion a system by which priests fresh from the seminary were sent to assist pastors of established parishes, which then attached mission churches as satellites. In 1940, the diocese numbered more than 33,000 Catholics attending 125 churches. Of the 141 priests serving in Arkansas, 59 were native born. One was Albert L. Fletcher, a St. John’s seminarian, who Bishop Morris ordained in 1920. Twenty years later, at the bishop’s urging, the Vatican assigned Msgr. Fletcher as auxiliary bishop for the diocese. Bishop Morris died Oct. 22, 1946, in Little Rock, knowing a successor was in place.